New Delhi, Jul 28: AIIMS has worked on 2,786 research projects over the past five years despite a large patient load, the institute has said in response to concerns raised by a Parliamentary committee. In a letter to the Estimates Committee of Parliament, AIIMS said the quantum of research activities performed should be viewed in context of the proportion of time the faculty invests amid the large patient load. The committee had expressed concern and questioned the research work in AIIMS. According to the letter, the large patient care load and the training programmes for undergraduates, postgraduates, doctors and post-doctoral students consume significant proportion of time of the institute's faculty. It says despite the odds, the institute has been identified as top-most in clinical and biomedical research. 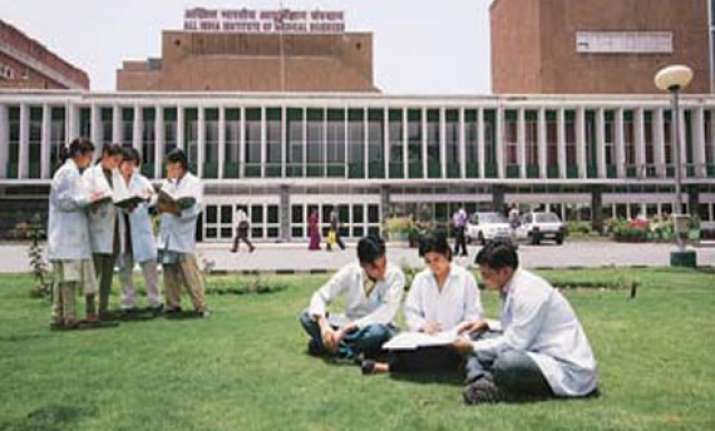 The research in AIIMS can be gauged by the impact on the creation of national health programmes and policies, including National Goitre Control Programme and Universal Iodine of Salt, Integrated Child Development Services Scheme, National Blindness Control programme, Fluorosis Control Programme under Technology Mission on safe drinking water, Oral Dehydration solution for Diarrhoeal Disease and National programme for Health Care of the Elderly, it says. The letter also mentions that even though AIIMS is not a technology institution, it has 13 patents and five communicated products attributed to its research workers. The institute also claims credit for the contribution of rota virus vaccine. The letter mentions that from 2011-12 onwards the intramural research funds have been enhanced substantially from Rs 50 lakh per annum. Intramural research funding of Rs 3 crore for 2011-12, Rs 4 crore for 2012-13 and Rs 5 crore for 2013-14 have been provided. In addition, individual grant has been enhanced to Rs 5 lakh for kits and consumables. After this enhancement, there have been 125 intramural research projects during 2011-12 and 59 in 2012-13. In addition to raising financial allocation, Institute Excellence Awards have been initiated from 2012-13 to promote the spirit of research and publication among faculty and scientists of AIIMS, the letter says.